When it comes to size, our Sun is small when compared to the size of some of the other stars in our galaxy. It is large in comparison to the size of Earth and the other planets in the Solar System. However, you will be surprised how small the Sun really is when it is compared to some of the largest stars in the Milky Way Galaxy. The Hertz-Russell diagram is plot of each star showing the relationship between its surface temperature (color) versus its luminosity compared to the Sun. Click on photo to enlarge it. The Sun is the largest object in the Solar System and contains about 99.866% of the total mass of this system. 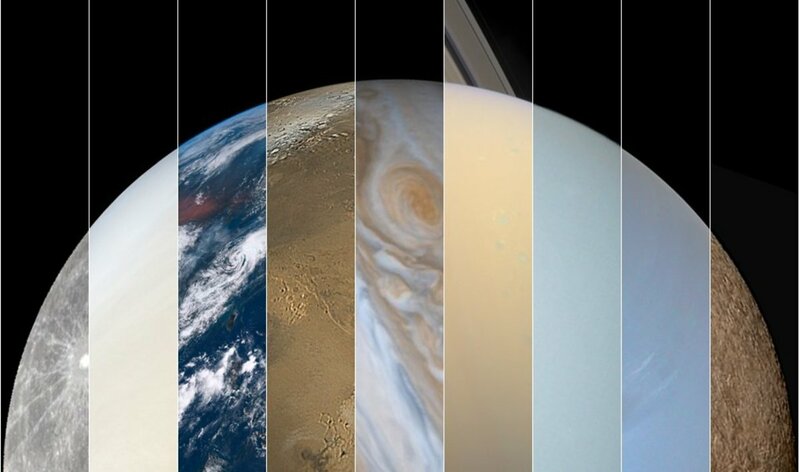 The other 0.134% of the Solar System mass is contained mostly in Jupiter while the other seven planets contain the remaining mass. From a size perspective, the Sun is ten times larger than Jupiter and hundreds of times larger than Earth as measured by its diameter. 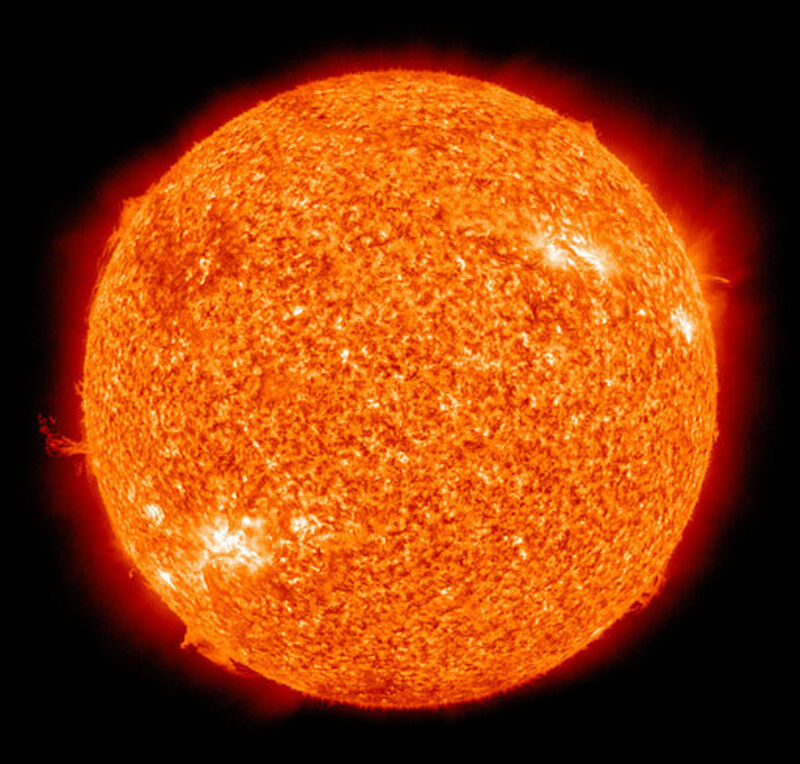 The Sun is described is a main sequence star because of the type of fuel it is burning. It burns hydrogen as its predominant fuel. That is, it follows a predictable life cycle where its mass and size along with its luminosity (color) varies as it ages. However, some stars do not follow this life cycle. 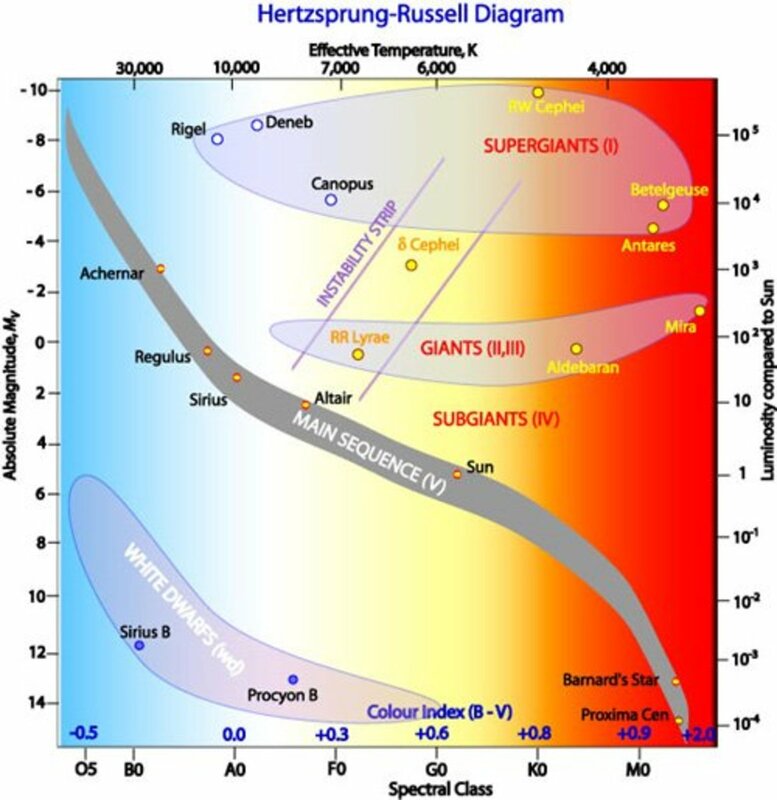 According to the H-R diagram or Hertzsprung-Russell diagram above, our Sun is a yellow star. The Sun is yellow because it is emitting all the color photons of light at the same time, but it emits a little more of it as yellow photons. On the other hand, red stars appear red because they are emitting predominantly red photons, but they are also emitting the photons in other colors and are cooler than the Sun. They are emitting light at a longer wavelength and lower energy level. According to the diagram, our Sun is now enjoying its middle age as far the age of the Sun is concerned. So it has a long way to go before it finally dies out. Here are nine stars that astronomers have found to be much larger and brighter than our Sun. The first is the star Sirius A, also called Alpha Canis Majoris A, the Dog Star. It is located about nine light years from here. It is a little more than two times the size of the Sun which makes Sirius the brightest star in the night sky because of its proximity to our system. 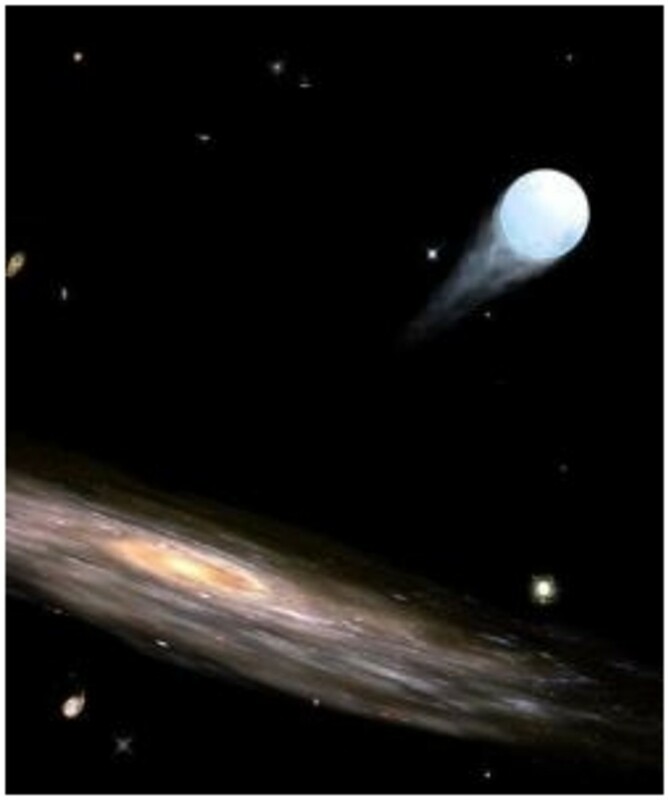 It is a main sequence bluish-white dwarf star similar to our Sun but brighter and hotter. Its main sequence lifetime is about 1 billion years, and it is currently 300 million years into its life cycle. So that means it will burn out in about 700 million years. For comparison, the Sun’s main sequence lifetime is about 14 billion years. The Sun is already more than 4 billion years into its life cycle. As you can see, we will be here for a while. Pollux is a red-orange giant star located in the Gemini constellation. It is larger than Sirius A and located about 34 light years from here. It is ten times bigger than our Sun. Because of its size, it is the 17th brightest star in our night sky and is 32 times brighter than our Sun. Pollux is not a main sequence star but falls into the category of red giants. Therefore, its life cycle is completely different from that of the Sun. If Pollux were switched in place of our Sun our planet would be a hot molten rock if not consumed entirely by the intense heat. There would be no life here. Arcturus, another red-orange giant star is located nearly the same distance away as Pollux is from us. It is about 37 light years from here and is the brightest star in the Bootes constellation. It is 25 times bigger than the Sun, and because of its size, it is the 4th brightest star in the night sky. Arcturus was once a main sequence star that is now in the sequence of the red giants. Aldebaran, one of two stars in a binary star system, is 65 light years away from Earth in the Taurus constellation. It is an orange-red giant with a diameter as high as 52 times the size of the Sun and is about 150 times as bright as the Sun. This star was once a part of the main sequence star group. These stars are really getting large now. Rigel, the first of the supergiant stars, is about 773 light years away. 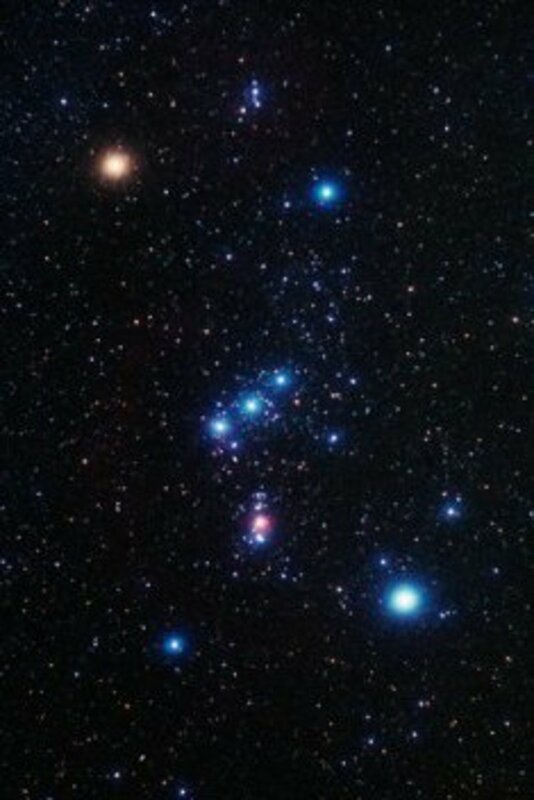 It is the 6th brightest star in the night sky located in the most familiar constellation in the night sky, Orion. You will see it as a blue-white star. 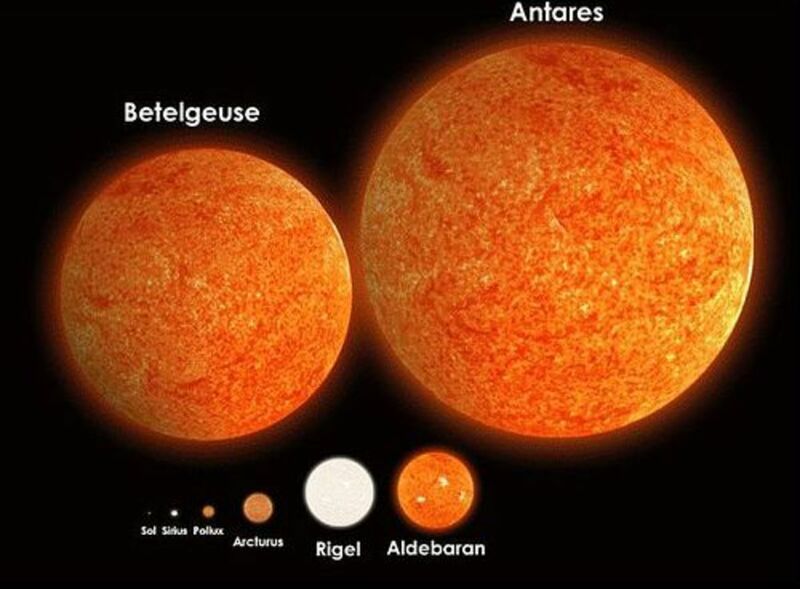 Rigel is 85,000 times as bright as the Sun and is 70 times larger than the Sun. The radiation from this star is 66,000 times more powerful than the Sun’s radiation output due to its output of other radiations besides visible light. Pistol Star, the first of the blue hypergiants, is much larger than Rigel. This star is 25,000 light years away and is located near the center of the Milky Way. It is estimated that this star emits light 10 million times brighter than the Sun and holds the title as the brightest known star in the galaxy. This star has a diameter of about 93 million miles. It would fill the space between the Sun and Earth if one edge of it were placed at the center of the Sun while the other edge would reach the center of the Earth. Antares A, another red supergiant star, is 600 light years away. This is the point where we are really beginning to see the largest stars in the galaxy. It is the 16th brightest star in the night sky and is 10,000 times brighter than the Sun. Antares is almost 430 times larger than the Sun. If it were placed at the center of the Solar System it size would extend beyond the orbit of Mars. Mu Cephei, sometimes called the Garnet Star because it gives off a deep red color in the night sky, is one of the largest stars you can see with your naked eye despite it being an estimated 1,550 light years away from us. However, some astronomers have estimated the distance of this star as far as 5,000 light years because it is difficult to get an accurate measurement of the distance of stars this far out from us. Despite its distance, it is one of the brightest red supergiant stars out there. It is 38,000 times brighter than the Sun. This star is 1,650 times larger than our Sun, and If it were placed at the center of our Solar System, it would fill the Solar system beyond the orbit of Jupiter. Finally, the last star in the list is VY Canis Majoris. It is the largest of the known stars discovered so far. This star is considered a red hypergiant star since it is so large. It is 4,900 light years from Earth with a diameter of 1.7 billion miles. If it were placed at the center of our Solar System, it would fill the Solar System beyond the orbit of Saturn. Because of its massive size, this star is expected to die in about 100,000 years as a hypernova. Fortunately, we will be safe from this explosion since we are so far from it. 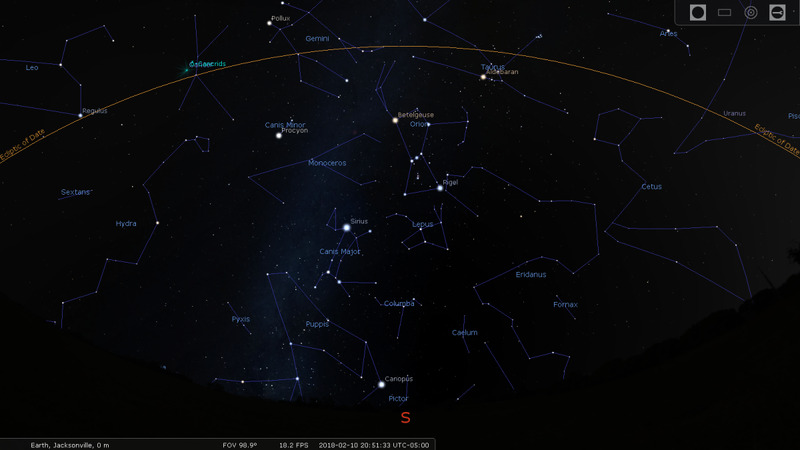 This star can be spotted in the constellation Canis Major (the “greater dog” in Latin) along with Sirius, the dog star. As you can see, there are a lot of stars much larger than the Sun out there. 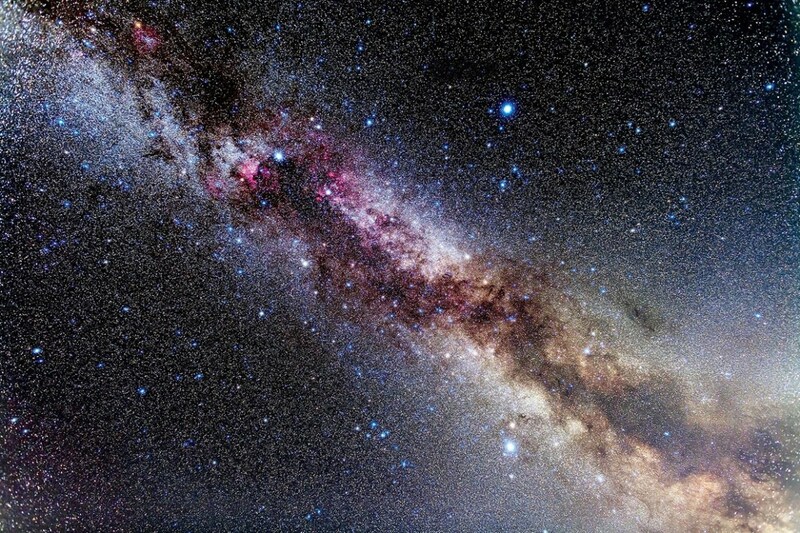 All of these stars are located just in our Milky Way. It is not difficult to imagine that there are probably more massive stars than these mentioned here in other parts of the Milky Way and other galaxies. There are a lot of big objects out there yet to be seen. 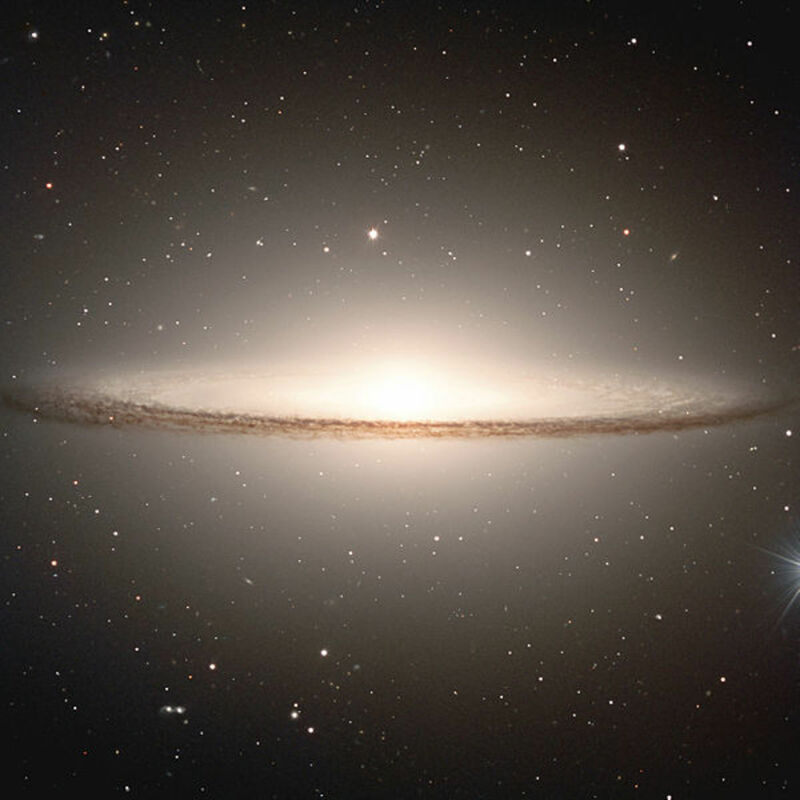 Be aware of the fact that with the Hubble Space Telescope we are just beginning to see other stars beyond the Milky Way Galaxy in our nearest next door neighbor, the Andromeda Galaxy. This galaxy is 2.5 million light-years away. Watch the video below to see the comparison of the size of our Sun to these stars. This video illustrates these comparisons very well with some very good music accompanying the animation. There are some big stars out there!!! An interesting read that could be much improved upon if numerous grammatical errors are fixed. I think as writers we should have a duty to edit out such errors before posting articles on this site. Exactly, almost anything you care to theorize about could be true. Since the Cambrian Explosion life has just varied. Not new species, just variations. So what happened 650 my ago which caused Venus' surface to become molten? Why does science now find comb jellies with musculature older than simple sponges? In my Beetle Sun, I propose that a super red giant (Beetle Sun) magnetically compressed to implosion produced Sol and the rocky planets in the former space. This is exactly backwards to what science proposes for Sol. The James Webb will find many more Sol with rocky bodies close. Man from Modesto, thanks for your comment. I believe you have it wrong. We have a very good understanding about the world around us and universe and there is still a lot to learn about them. Einstein's theory about the speed of light being the ultimate speed in universe is still valid until otherwise proven wrong. I read about the sub-particles traveling faster than the speed of light but the experiment have to be repeated to make sure the results are real. There is an extremely small margin of error here. You are talking about 10 nanoseconds. This is an extremely brief period of time. One nanosecond is 1 billionth of a second. It is possible they might had miscalculated somewhere in their experiment. As far as the measurements of the stars are concern, many of these sizes have recently been confirmed by the Hubble Space telescope. Even if they are off by a little bit there are stars out there that are much larger than our Sun. You can very easily seen these stars in the constellations without the aid of a telescope and they are very far away and are much brighter than other stars out there. Those two facts tells us these stars must be much larger than the Sun. LoneStar77, thanks for your comment. I will make your suggested corrections in the my hub. There is a lot of information out there and sometimes they are wrong or are presented in the wrong context. You sound like you know what you are talking about here when it comes to astronomy. I think I can learn a thing or two about astronomy from you. Again thanks. Melpor, an interesting hub. Astronomy has been a passion of mine for over 50 years. I hope you don't mind a little hard critiquing. In your section on the Sun, your statement that Jupiter contains the other 1% leaves no room for the other planets. Perhaps you could say that Jupiter takes the lion's share of the remaining 1% -- or give a specific percentage of that remaining 1%, whatever the figure happens to be. My own calculations show the sun at 99.866% of the system's mass, leaving only 0.134% (just a little over a tenth of a percent) for all of the planets. That's not even close to 1%! Jupiter is not even 1/10th of a percent. Jupiter contains about 71% of the total planetary mass. Also, you say that the sun is 10 times larger than Jupiter. This can be misleading. Are you talking about diameter or volume? The sun is approximately 9.96 times the diameter of Jupiter, so it must be diameter you're talking about. But when you say that the Sun is 700 times larger than Earth, I have no idea where you're getting this figure. Comparing diameters, the Sun is 109 times greater than Earth. Comparing volumes, however, the Sun is roughly 1,300,000 times the volume of Earth. The Sun's membership in the main sequence is not a function of electromagnetic terms as you state, but more a function of the fuel it burns -- hydrogen versus the heavier elements, helium, carbon, etc. And luminosity is not equivalent to color. There are very dim (low luminosity) red dwarfs and there are very bright (high luminosity) red giants -- same color, but widely separated luminosities. The Sun is a "yellow" star because the greatest strength of its output is in the yellow band of frequencies. Even so-called "red" stars are emitting in a broad range of "colors," just as is our Sun, but their peak frequency is in the red band. The spectra emitted by all stars forms a bell curve across all visible frequencies. Even the so-called "red" stars emit in green and blue bands, but not as much as the hotter stars. You mentioned with Rigel that it is 85,000 times as bright, but 66,000 more powerful than the Sun's radiation output. Now, "bright" usually indicates visible radiation which is not all of the output spectrum. Somehow, I think you have the numbers mixed up. Total output (or bolometric magnitude) should be larger than visible output (visible magnitude). In your discussion of the Pistol Star, you might say brightest "known" star in the galaxy. There may be others more bright. Also, your statement that it "would fill the space between the Sun and Earth," is a little misleading. If the Pistol Star were centered on the Sun's position, it would only reach halfway to the Earth. Only if one edge of the Pistol Star extended to the center of the Sun would the other edge touch Earth. Learning can be fun, but it helps if facts are portrayed in the correct "light." I sincerely hope this helps. May God bless your efforts. Scientists at CERN declared last week that they have found experimental evidence which refutes Einsteins theory that light is the fastest speed possible. Our understanding of physics, space, and time are extremely crude. 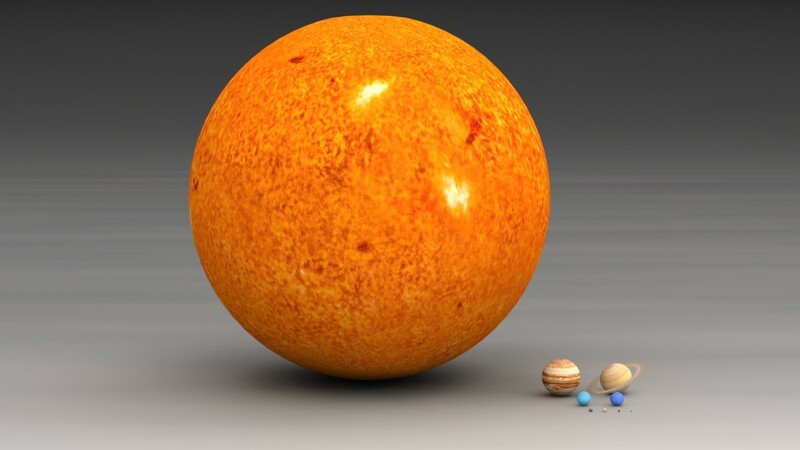 The chances that the estimates of the sizes of these suns are accurate are very small. 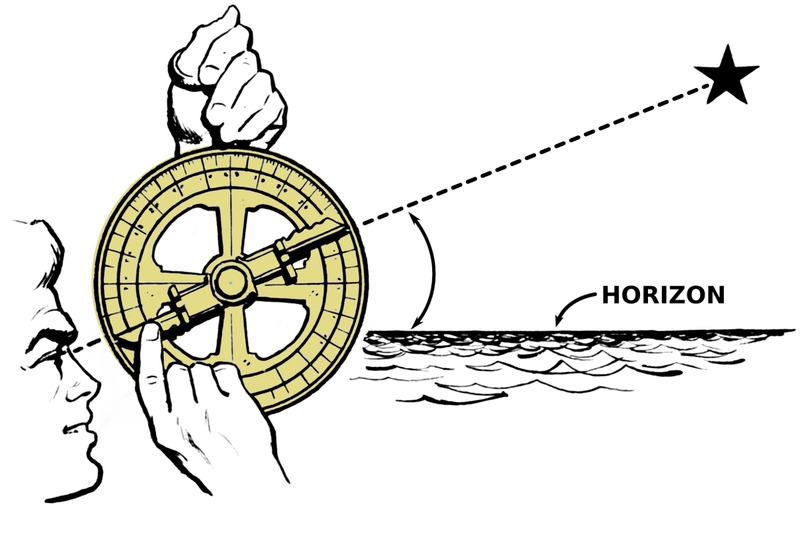 Theories of the geography of space and time are very complex, and few have been disproven. All we are able to discuss is the most popular understanding. Hopefully, it has some good reasoning behind it.